Evolve Culture, Build Partnerships, Drive Value; Satisfy Purpose. We are excited to announce this year’s keynote speaker at the World BRMConnect Conference, Danielle Hellebrand! In this highlight article, Danielle shares her valuable take on Relationshipism and the future of business management, primarily driven by a strategic BRM capability and human connection. What would you attempt if you knew failure was impossible? When we respond to opportunities with positivity and motivation, our bodies release dopamine. The release of this prized chemical in the brain, known as the “reward drug”, naturally improves our mood, increases our focus, and boosts internal motivation. As a firm believer in business relationship management’s ability to drive value, evolve culture, and build partnerships to satisfy purpose, Jeremy Byrne successfully provides value to almost every corner of his organization through a BRM capability. A BRM capability provides invaluable benefit to both employees and their organization by promoting intangible value. Join Thousands of Business Relationship Managers! 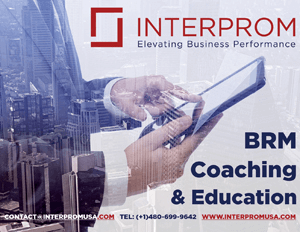 Receive expert BRM insights delivered straight to your inbox and achieve greater business value! Click here to learn more. To inspire, promote, and develop excellence in Business Relationship Management across the globe, leading to outstanding business value for organizations and professional fulfillment of every individual member of the BRM community.